Tracey Emin (1963-), Artist. Sitter in 12 portraits, Artist of 2 portraits. Tracey Emin (1963-), Artist. Artist of 2 portraits, Sitter in 12 portraits. In an ironic reference to the autobiographical nature of her work, Emin has cast her own death mask during her lifetime, creating a contemporary portrait with a historic allusion. Traditionally death masks were predominantly made of male subjects, and this work aims to challenge masculine dominated biographic and artistic commentaries. The fabric on which Emin's bronze head is placed refers to her frequent use of conventional handicraft techniques such as quilting and embroidery, associated with the domestic sphere of women. 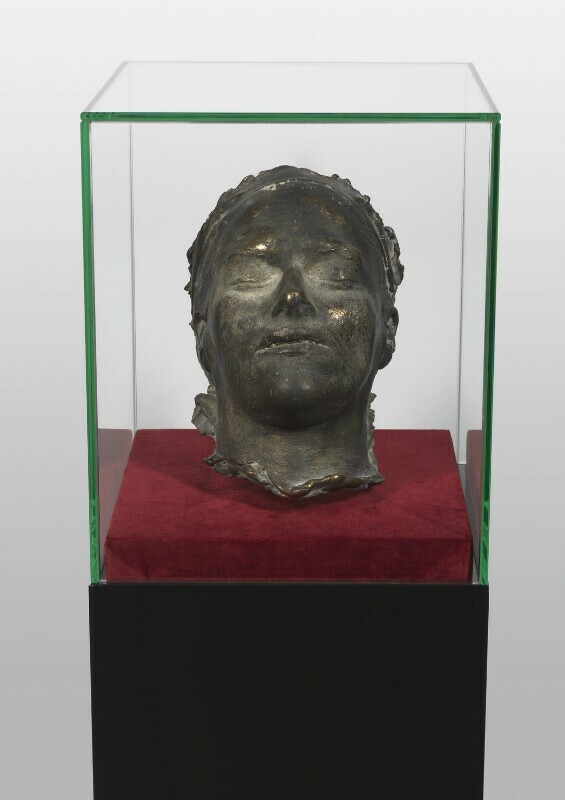 Death Mask is one of four unique ‘life masks’ of the artist’s face made in 2002 – each with a different patina and finish. NPG 7034 is made of distressed bronze with gold leaf. It marks an important turning point for Emin as it was the first sculptural work that she made in bronze, a medium now central to her artistic practice. 2002 was an eventful year for the Royal Family, highlighted by the Queen's Golden Jubilee celebrations, but marred by the death of Princess Margaret, followed just three months later by the death of Queen Elizabeth, the Queen Mother at the age of 101 (making her the longest lived royal in British History). The relationship between two of the greatest modern masters is celebrated in Tate Modern's blockbuster exhibition Matisse Picasso. By exhibiting their works side-by-side, the show revealed the relationship between the two artists from 1906-54. The 'Party at the Palace' concert in celebration of the Queen's Jubilee brings together stars from the last 50 years of Pop: Paul McCartney, Tom Jones, Brian Wilson, Queen, Ozzy Osbourne and Elton John. Terrorist bombing attacks on the Island of Bali in Indonesia leave 202 people dead, including 25 Britons. The three attacks took place in a bar, outside a nightclub and outside the United States consulate, and were aimed at foreign tourists, although many locals were also killed or injured. The Islamist group Jemaah Islamiyah were found guilty of perpetrating the attacks.